Today is June 21st. I have in this very room, right here with me, a complete, ends-woven-in baby blanket. I brought the blankie with me to do the finishing touches and weaving in of ends so I would have something to do at the hotel where I am staying for a seminar. I wanted to post to my blog before I go home today. The blankie needs only to be blocked, so please ignore the waviness and rumpliness: Also please ignore the hotel bedspread. I shouldn't complain, however. This hotel is in Gulfport, Mississippi, and was badly affected by Hurricane Katrina, and they are making do with oddments of furnishings as they repair the building and re-open one floor at a time. 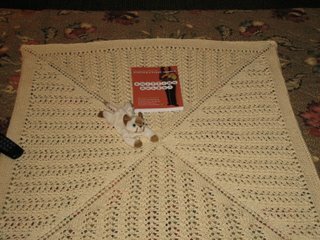 I also brought along a copy of Yarn Harlot's latest book, Knitting Rules!, for bedtime reading. The only thing I had in my possession to make the blankie look cutesy and baby-ish was Meezer the Car Cat, who was a gift from my student worker a few years ago who noted that I had pets everywhere except in my car. Meezer usually rides around in the ashtray. The blankie was knitted center-out as a part of a study of several garments using variations of the same lace pattern. I may just possibly include this in my pattern book. Hopefully you are not snorting coffee out through your nose. Hopefully, you are saying something along the lines of, "hey, even in its unblocked state, that's a halfway-decent looking blankie that any self-respecting baby would be delighted to yark her peas and carrots on." So why, you may ask, do I say that this cannot be good? I have a complete, full-size blankie on June 21st and my niece's baby is not due until September. There is another baby in there that we don't know about. I'd better tell the mother. 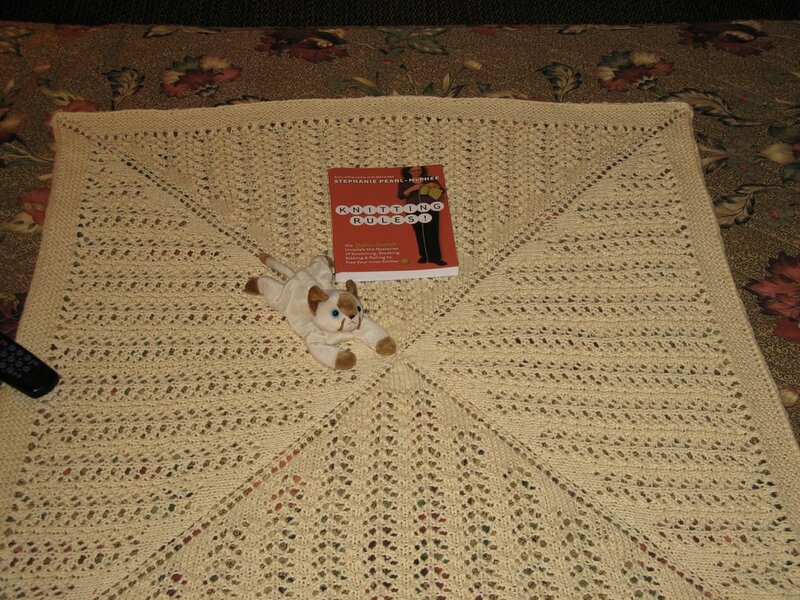 Please, Dez, include the center-out baby blanket pattern in your book. I'm just learning to do center-out lace and would love to make this pattern. I love your car cat. I have a somewhat tattered blue dolphin my daughter bought me at Marine World who rides in my ashtray. That blanket's a winner! Baby blankets usually suffer from the curse of boredom: who wants to knit for that long on a pattern! At least, from the center out adds to the attention you must pay to your knitting. No animal in my car, probably because my Meezers are decidedly NOT fond of rides. VBG!